Add chicken, soy sauce, vinegar and black pepper in a bowl. Add salt, Chinese salt and corn flour and mix well. Store in refrigerator for around 2 hours for marination. Beat two eggs and add to chicken; and mix well. Deep fry in heated oil. Delicious spring chicken is ready to serve. Put in a bowl chicken, soy sauce, vinegar and black pepper. Then add salt, Chinese salt and corn flour and mix everything well. 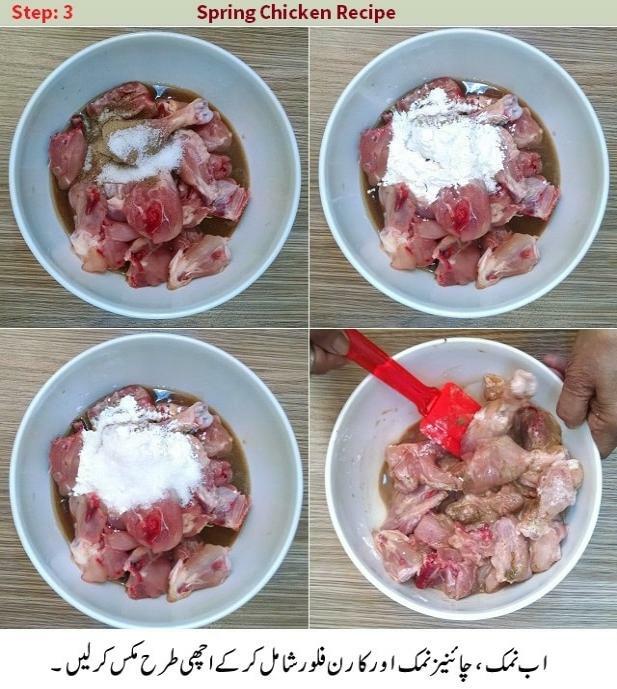 Place in refrigerator for around 1 to 2 hours to marinate the chicken. Add in 2 beaten eggs and mix well. Deep fry all chicken pieces. Spring chicken is ready to serve. Enjoy with tomato ketchup and raita. Get a step by step recipe for fried spring chicken. It is delicious, easy to make and a highly popular chicken snack. 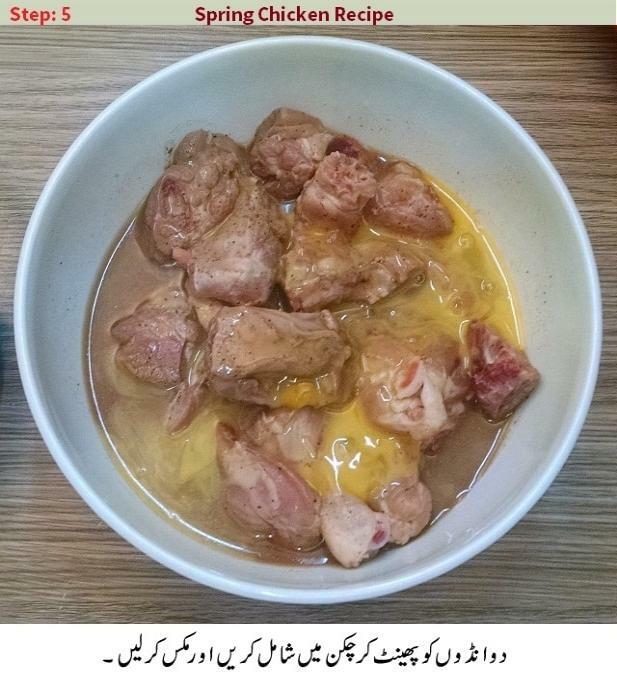 It is eaten zealously in America, Europe, Pakistan, India, China, Thailand and many other countries. Here today, Chef Naushaba Ahmed tells how to make spring chicken with step by step instructions aided with relevant images for each step. You would find this and similar chicken recipes in the menu card of exquisite and prominent restaurants in Karachi, Lahore and Islamabad. If you have had eaten it ever, you must be glad to find its recipe. 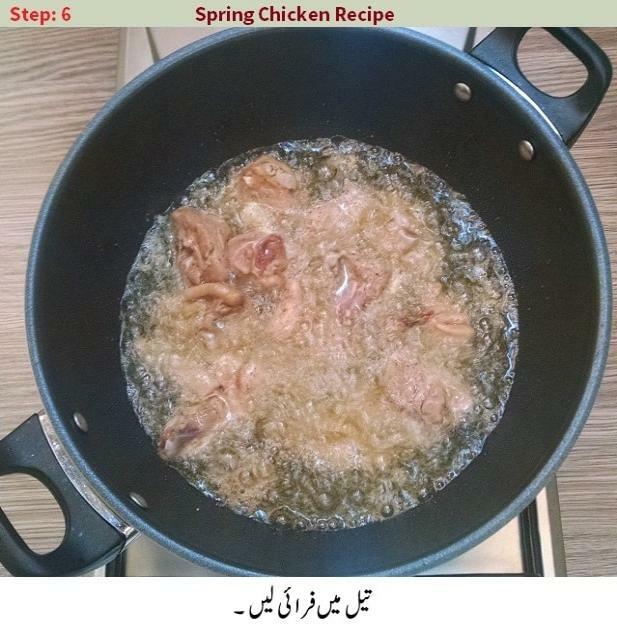 KFoods.com is presenting how to make fried spring chicken recipe in Urdu. Enjoy this exclusively delicious chicken snack! 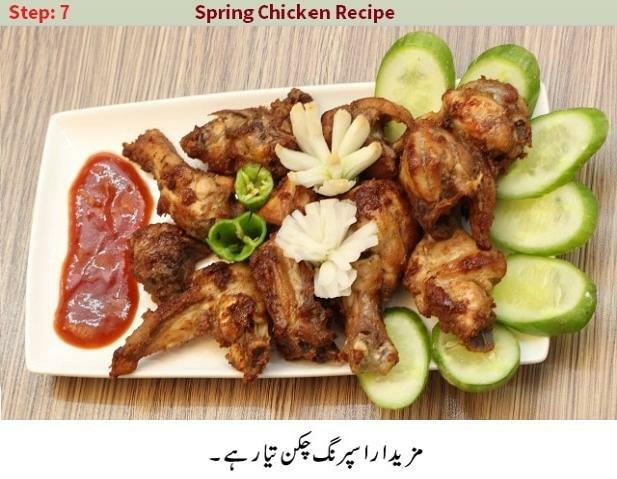 Fried Spring Chicken Recipe It is delicious, easy to make and a highly popular chicken recipe.It is eaten zealously in America, Europe, Pakistan, India, China, Thailand and many other countries.It is very easy to prepare tasteful and my whole family also like it to make it. 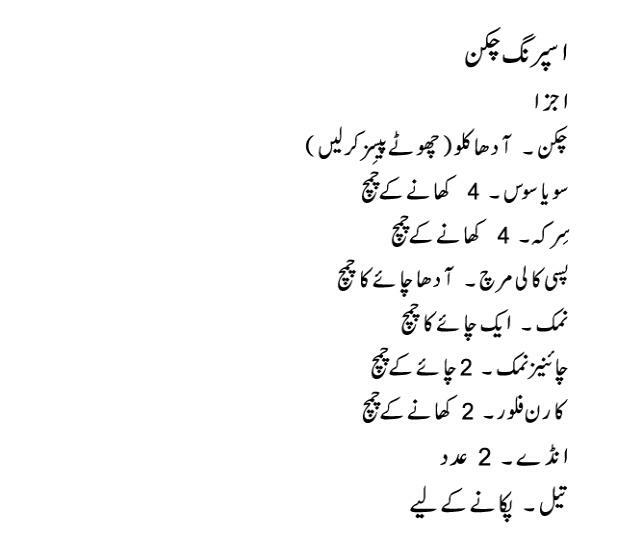 Good recipe. Next time I might tinker a bit by adding some additional ingredients, celery, more onion, its a very quick to make the recipe at tea time. I just wanted to ask that if we can freeze the chicken after marinating. spring chicken looks great with salad. 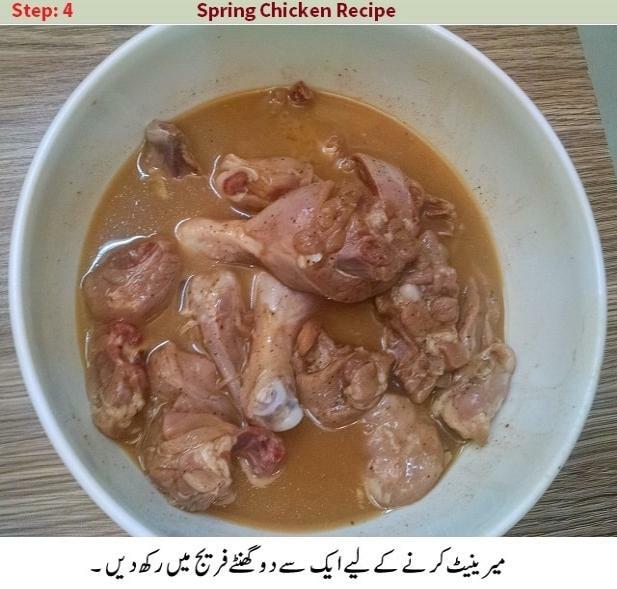 I have recently visited my friend's home where she served spring chicken which was very delicious , then I searched for its recipe and found it here . I will try it. Read Blog about Fried Spring Chicken Recipe and health & fitness, step by step recipes, Beauty & skin care and other related topics with sample homemade solution. Here is variety of health benefits, home-based natural remedies. 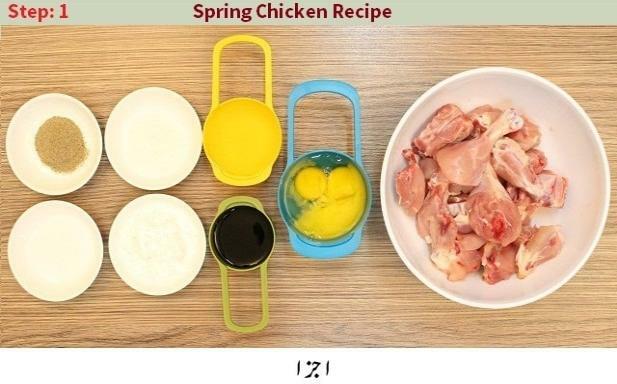 Find (Fried Spring Chicken Recipe) and how to utilize other natural ingredients to cure diseases, easy recipes, and other information related to food from KFoods.